Next to the Neko Cafe now there is a mini-playground with a swing. If you date a girl she will swing on her own, and if you date a pillow you can just place it on the second seat. 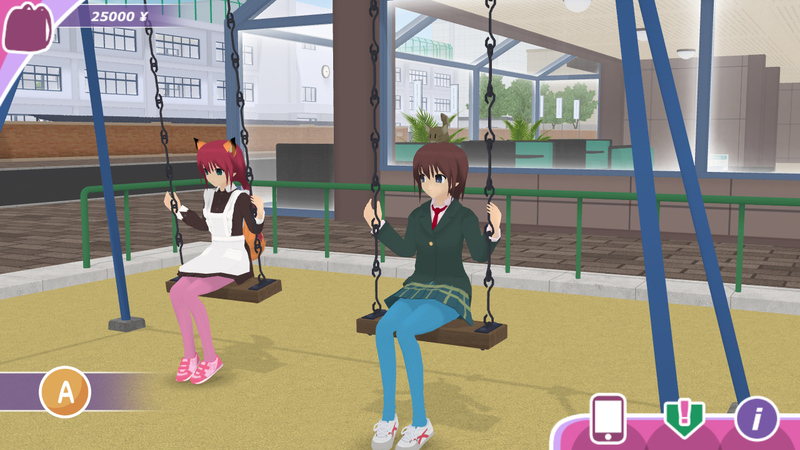 The swing will be a part of a larger playground area in a different location, but since it will be quite a while as yet before that new location is released, I added the swing to the school map for now. Now every day there is a 50% chance of rain, which will last for several minutes. The rain will prevent you from having outdoor dating activities unless you give an umbrella to your girlfriend. More weather effects (and, hopefully, dynamic day/night cycles – which are in research/experimenting stage now) are planned for future updates. One additional hair style and a new hair color are available in the beauty salon. Configuration dialogue for screen resolution settings now has game logo. In addition to fixed 16:9 aspect ratio now there is an option (in the in-game smartphone) to set fixed 18:9 aspect ratio. This can be useful for ultra-wide screens (20:9, 22:9, etc. ), since more screen space will be used for the game. Screens wider than 18:9 can be used only with fixed aspect ratio, for all other screens you can set aspect ratio to “free” and the game will adjust UI accordingly. In phone settings menu now there is a new setting for adjusting mouse wheel scroll speed. Depending on your OS and mouse this speed can be different, so this setting is useful for adjusting scroll speed. “Hidden recipes” are removed – now you can see full recipes for all food in your recipe book. Unlocking full recipes by trying to put random ingredients wasn’t as interesting as I originally thought it would be, and resulted in people mostly ignoring the cooking feature and using cafe instead. That’s why hidden recipes are removed for now. Fixed an issue with water refractions not working on Windows 7/8/10 (DirectX 11 issue). Now you (hopefully) will see correct water distortions in the school pool and in the shrine pool. Fixed a minor issue with incorrect camera placement that happened if you used quick camera mode in places with fixed camera view. Fixed an issue with coloring of certain clothes and items with multiple materials that happened if you used color umbrellas. Fixed a bug that happened if you opened your pillow’s status window while sitting. All bushes in the school are replaced with new models. All texts in the girlfriend’s status window now will be displayed correctly for chosen language (depending on whether they were translated in the wiki by contributors). Fixed several small animation issues. Fixed several minor collision issues that happened if you attempted to push your girlfriend while she was performing sitting animations. More accurate attaching of cosplay tails. Better textures for cosplay tennis shoes with red stripes. There was a significant bug in the 0.7b release disabling AI of your girlfriend if you turned off “selfie mode” by using “Q” keyboard key. This bug if fixed in 0.7c update. What are you going to work next ? 2. New map, for which I have about 30% of required minimum content and gameplay thus far. These two are my main priorities for April ~ May. Please return to the game click the ability to interact with 3d objects and secret ingredients in recipes.These mechanics were good. Well, I’ll keep tracking comments/feedback to see how to make those features more interesting. Nothing is final at this point, so it’s quite likely everything will change many times as yet before final release. You are right. The swing physics need more work. I’ll try to improve it.